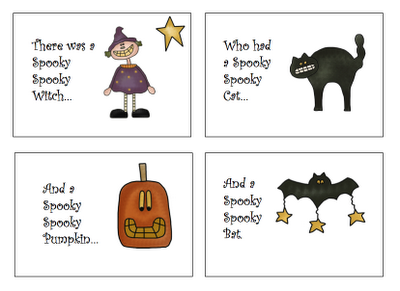 How about a cute, spooky tale to get you in the mood for Halloween? I made this cute little book using graphics from Scrappin' Doodles and would love to share it with you! It's a 7-page rhyming book with a pop-out ghost at the end that is sure to charm your little ghosts and goblins. All you have to do is print it and cut out the pages and you're ready to go. The pop-out ghost is the best part of this spooky little tale. Just fold a strip of paper accordion-style, glue one end to the ghost and one end to the "Boo" page. He will pop right out when the "door" page is turned. If you'd like to download a copy, you can grab it here. What do you think? Will you use it? Tell me how! So cute! Thanks for sharing! I will use this with my preschoolers as well as my s-blend kiddos. I'm glad you like it Tracey! That's for the feedback.